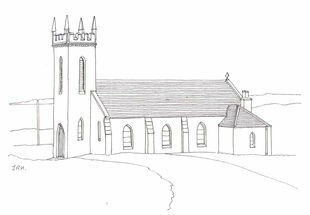 The church was one of the first built under the new Church Extension Scheme of the Church of Scotland in 1937. The architect, Leslie Graham Macdougall, also designed the Reid Memorial Church. The stone comes from Craigmillar Quarries and the bell (originally from St Aidan’s, Melrose) dates from 1866. There are many interesting bronzes and the stained glass windows are also notable.